If you’re like most people, you probably started off the year with a whole list of resolutions: more sleep! Less coffee! More exercise! Less television! More vegetables! Less sugar! Still here? Good! These homemade candy bars are so tasty, they’re worth the extra time at the gym or handfuls of spinach in the salad. Each chocolate bar is jam-packed with peanut nougat, creamy caramel and salty peanuts, for a taste that’s just like your favorite candy bar. 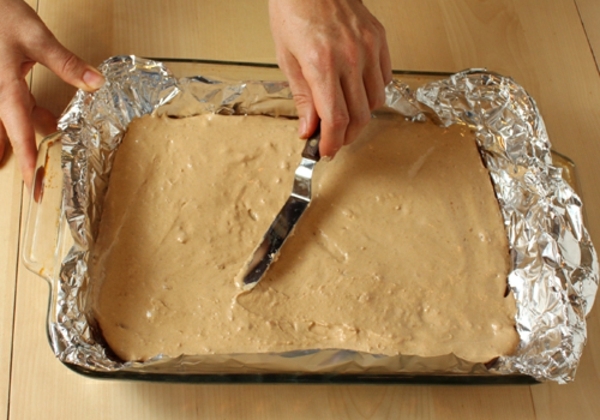 To make it easier to remove and cut the bars, line a 9×13 pan with aluminum foil. Melt the candy coating and spread a very thin layer on the foil. Don’t use much–maybe1/2 cup total. 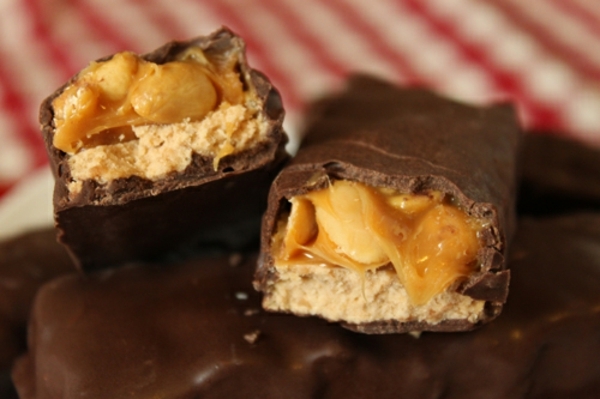 This is just to keep the nougat from sticking and make the homemade candy bars easier to dip. Refrigerate the pan to set the coating while you prepare the rest of the filling. The bowl of melted coating can stay at room temperature until you’re ready to use it again. Most nougat recipes are pretty complicated and involve whipping egg whites into a meringue and using a candy thermometer to boil a sugar syrup. Not this one! I’ll show you a quick and easy way to make a nougat filling for homemade candy bars that tastes just as good as the complicated ones. 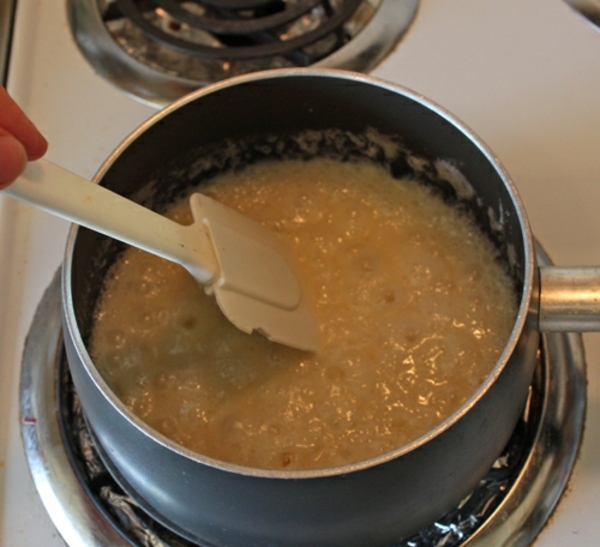 In a medium saucepan, combine the butter, granulated sugar, and evaporated milk. 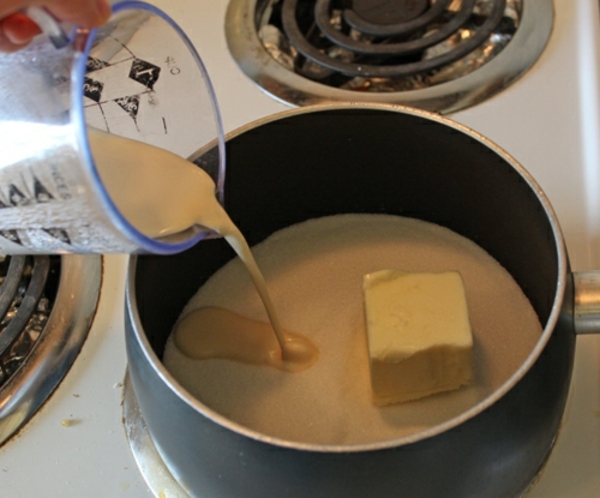 Place the pan over medium-high heat and stir frequently until the butter and sugar dissolves. 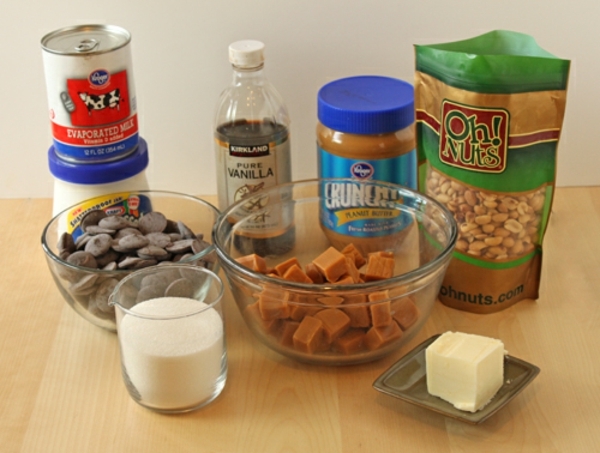 Meanwhile, make sure the peanut butter, marshmallow creme, and vanilla extract are measured out and are nearby, so you can grab them as soon as you need them. Bring the mixture in the pot to a boil, and boil it for four minutes, stirring constantly to keep it from scorching. During this time it should go from light and liquidy to darker and more syrupy in color and texture. 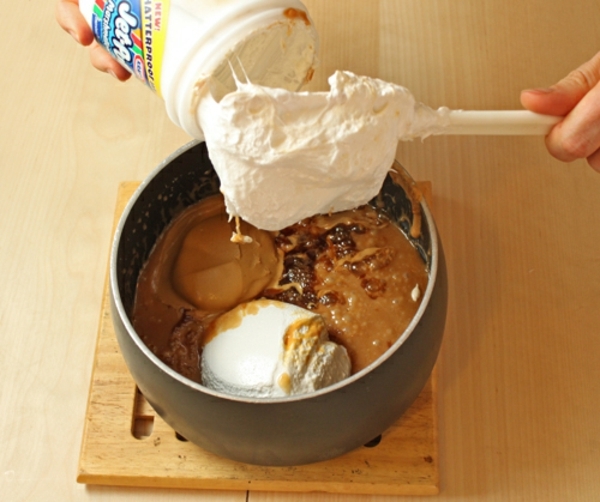 After four minutes, immediately remove the pan from the heat and stir in the peanut butter, marshmallow creme, and vanilla extract. Stir it in quickly, before the sugar syrup starts to harden and crystallize. Once it’s mixed in it should be a light beige color and a fluffy texture. 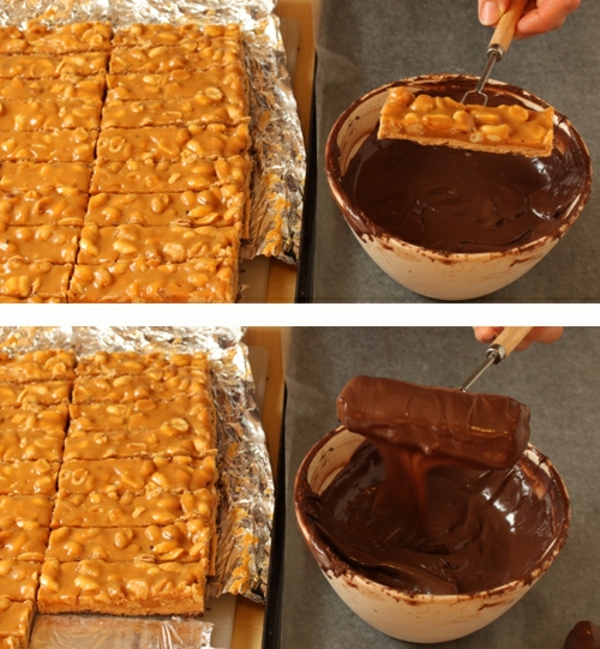 Scrape the peanut nougat on top of the chocolate layer in the pan, and spread it into a smooth, even layer. 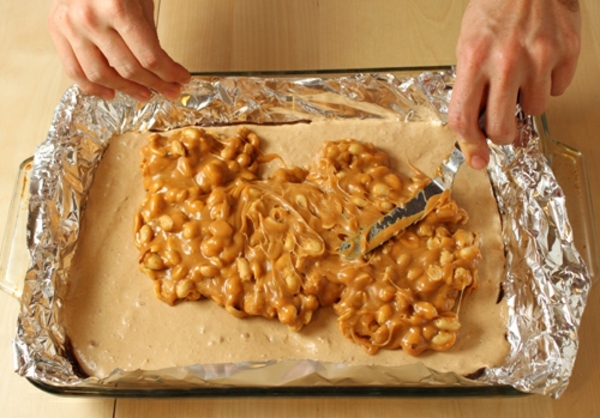 Refrigerate the pan to cool the nougat down while you prepare the caramel layer. And by “prepare,” I really mean “microwave,” because this recipe is all about shortcuts and efficiency. 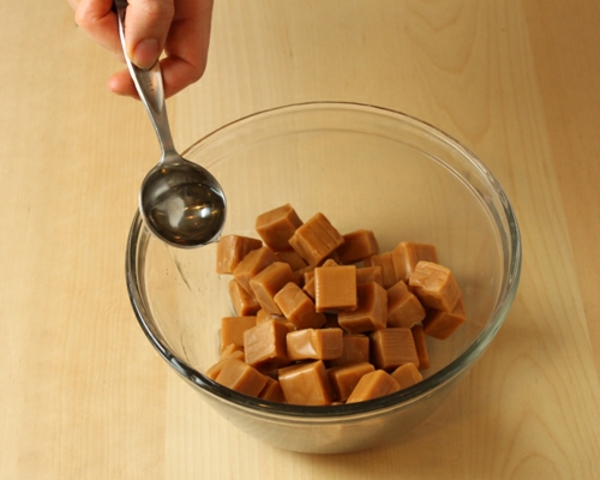 Place the unwrapped soft caramels in a microwave-safe bowl and add a spoonful or two of water or cream. The exact amount kind of depends on how soft your caramels are to begin with–if your caramels are difficult to bite through, you’ll want to add several spoonfuls to loosen them up and make the caramel in the candy bars soft and silky. However, if they’re already quite soft, just a tablespoon of water or cream should do the trick. Microwave the caramels in 30-second bursts until melted, stirring after every interval. It should take 1-2 minutes to get them liquidy and smooth. 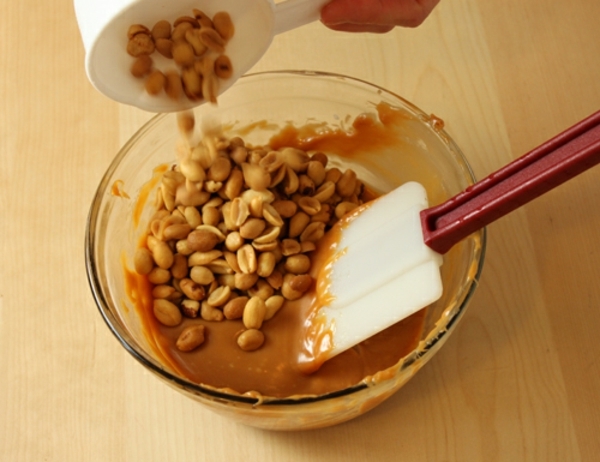 Add the salted peanuts and stir until the peanuts are completely coated with caramel. 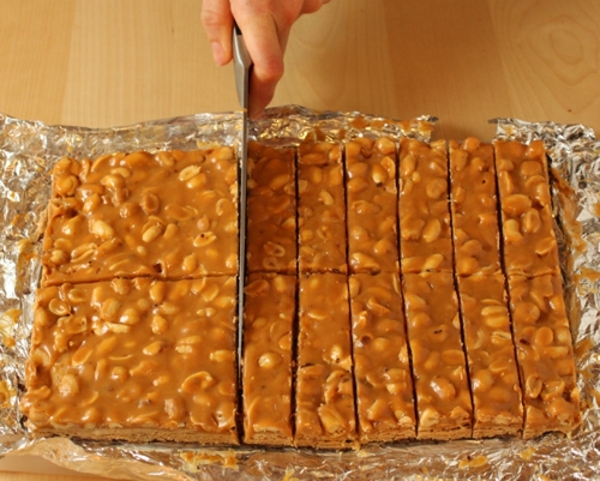 Spread the peanutty caramel (or caramelly-peanuts) on top of the peanut nougat. If it’s difficult to do with a knife, you can wet your hands and use your hands to press them into an even layer. And remember, sweets are an art, not a science, so it’s fine to have some variations and imperfections. Refrigerate the pan to set the caramel, for about 45 minutes. It doesn’t need to be rock-hard (in fact, that makes it more difficult to cut) but it should be set enough to not ooze when you cut into it. 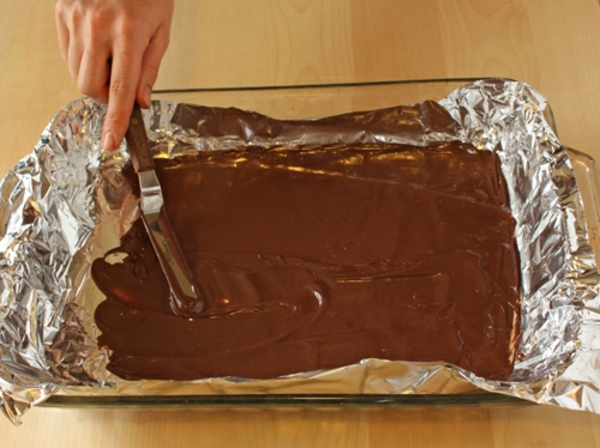 Once set, remove the candy bars from the pan using the foil as handles. Use a large sharp knife sprayed with nonstick spray to cut the tray into small bars. If you want to make them close to average candy bar size, cut the tray in half lengthwise, then cut each half in about ten 1-inch intervals, for a total of 20 homemade candy bars. And now to finish the masterpieces! Check on your candy coating: if it has started to set, microwave it again until it is smooth and fluid. Use forks or dipping tools to dip each candy bar in the coating until completely covered, then tap the fork against the lip of the bowl so excess coating drips off. 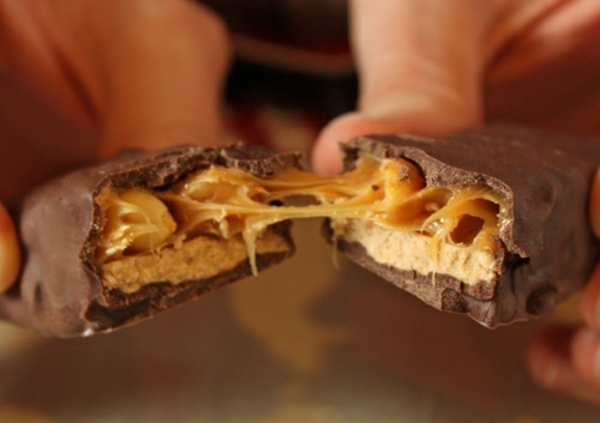 The chocolate layer on the bottom of the bars should make it pretty easy to dip these candy bars. Set the dipped bars on a sheet of waxed paper to cool and harden completely, or put them in the refrigerator to speed the process along. 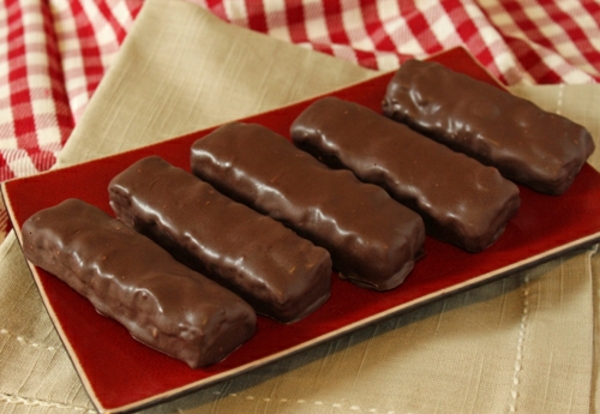 Once they’re set, your homemade candy bars are ready to eat! Keep them at room temperature so the nougat and caramel stay soft and luscious. If kept in an airtight container, they’re good for at least a week, although I can’t believe they’d really last that long without being eaten. My apologies to your New Year’s Resolutions, but these homemade candy bars are just too good not to share. Besides, there’s always next year!